Red Faction: Guerrilla is an extraordinary game. I’ve never before seen such a collection of bland mediocrity hauled quite so far by a single great idea. 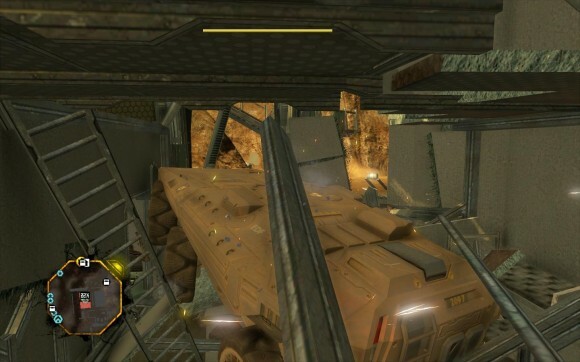 This being the Red Faction series, that great idea is destructible terrain, and Guerrilla is the first title where the technology has finally matched the intent. The Geo-Mod engines used for Red Faction 1 and 2 were rather haphazard implementations of the concept with rockets scooping out huge and unrealistically-shaped geometric spheres from the surrounding terrain, and they never came close to their full potential due to coding limitations (realistic physics engines weren’t even a thing when the first Red Faction game was released, for example). Guerilla takes advantage of improved technology in that regard, but it also wisely narrows the focus: rather than making the entire world destructible, Guerilla just lets you blow up all the buildings in it instead.